This has always been a favorite of mine... despite some irritating characters. Lots of fun to watch... recommended! Found this to be an entertaining film... but definitely seen better. But a decent time waster. Definitely a classic... been a favorite of mine for years! A must see! William Shatner stars as veterinarian "Rack" Hansen in this cult classic about an Arizona town infested with eight-legged killers, which turn on the humans whose insecticides have depleted their normal food supply. Woody Strode, who played the title role in John Ford's Sergeant Rutledge and won a Golden Globe Award for Spartacus, is Rack's friend, rancher Walter Colby, whose livestock first fall victim to the angry arachnids. Entomologist Diane Ashley (Tiffany Bolling) arrives and tries to help Rack deal with the crisis, but with the big country fair fast approaching, Mayor Connors (Roy Engel) refuses to let them quarantine Colby's ranch. Soon, the remaining residents are barricaded at Emma Washburn's (Lieux Dressler) lodge, fighting for their very lives, in this skin-crawling chiller featuring Shatner's then-wife, Marcy Lafferty, as his sister-in-law, Terry. This was a lot better than I was expecting. Granted, I wasn't expecting a lot based on the cheap DVD release I have, but even ignoring that it's still a movie from the late 70's titled Kingdom of the Spiders. I picked it up for my collection solely based on the presence of William Shatner, because I'm that much of a trekkie. Shatner gives the performance I'm expecting here, which is to say solid and heroic, but not particularly nuanced (this is no Boston Legal). Still, I enjoy seeing him. I was pleasantly suprised by the portayal of his love intrest, who is a competent and knowledgeable scientist, and is proven right even when no one believes her. I also liked the low angle, tarantual perspective shots, which added to both the camp and the threat of the film. If the film starts fairly predictably, it certainly doesn't end that way. The ending is unexpected and I really enjoyed that. Recommended if you're a Shatner fan, or if you're looking for a good creature feature. This definitely was one. The tale of two fragile and sensitive vampires, Adam (Tom Hiddleston) and Eve (Tilda Swinton), who have been lovers for centuries. Both are cultured intellectuals with an all-embracing passion for music, literature and science, who have evolved to a level where they no longer kill for sustenance, but still retain their innate wildness. Their love story has endured several centuries but their debauched idyll is threatened by the uninvited arrival of Eve's carefree little sister Ava (Mia Wasikowska) who hasn't yet learned to tame her wilder instincts. Driven by sensual photography, trance-like music, and droll humor, Jim Jarmusch's ONLY LOVERS LEFT ALIVE is a meditation on art, science, and the mysteries of everlasting love. I'm kinda torn on this film. I loved the performances - Tom Hiddleston and Tilda Swinton are great, and this is a great character study, especially of Hiddleston's character. There's such great atmosphere, beautiful scenes and interesting ideas. It's wry and melancholy, with an interesting criticism of both the decline of art and culture and of those who bemoan the decline thereof. Still, something about it didn't click with me. Maybe I wasn't in the proper mood - and it's a moody piece, there's very little plot here. I want to go back to it at some point, probably when I'm more in the mood for an art film or drama. Despite the presence of vampires, this has very little horror. This is a film that my daughter and I used to watch... so holds some nostalgia for me. I found it to be a fun movie. 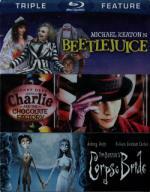 I have seen better, but is well worth the watch and perfect for family entertainment during the Halloween season. I recommend giving it a chance. As an initiation rite into Alpha Sigma Rho fraternity, four pledges must spend a night in Garth Manor, twelve years to the day after the previous resident murdered his entire family. Two of the pledges, Marti (Linda Blair, The Exorcist) and Jeff (Peter Barton), ignore the rumors that the now-deserted mansion is haunted by a crazed killer, until one-by-one, members of their group mysteriously disappear. Could this be part of a fraternity prank or is a demented former tenant seeking revenge? When their seemingly innocent rite of passage turns deadly, these college students will do anything to survive Hell Night. This one I kinda have mixed feelings about. It is good for what it is... but you kinda expect more from it. It is just an average typical '80s slasher film. A bit on the low budget side. Entertaining but not overly so. This one has Linda Blair in it... I always liked her for some reason. She isn't the best actress out there... and she is cute but not great looking. But there is just something there that always appealed to me. She is the only familiar face in this movie. Pretty much everyone else I have no idea who they are. A decent movie to waste a couple hours with... but nothing to get too excited about. I am not sure why they rated this movie R... really nothing in it that is all that bad. Must just be when it was rated. I would think if it was put through for rating today it would get either a PG or a PG-13 at the most. From the studio that brought you Pirates of the Caribbean comes the fright-filled comedy adventure with eye-popping special effects presented for the first time through the magic of Blu-ray Disc technology! 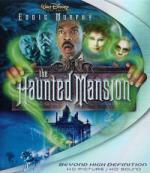 Eddie Murphy stars as a real estate agent whose family comes face-to-face with 999 grim, grinning ghosts in the creepy old Gracey Manor! Experience each supernatural effect in 1080p High Definition, and hear each ghostly wail in astonishing 5.1 48 kHz, 24-bit uncompressed audio. The unparalleled realism of Blu-ray Disc technology delivers you directly into The Haunted Mansion... if you dare to venture inside. This one is definitely not the best ghost movie I ever seen... but what it is... is a fun way to spend 90min. If you are looking for scares you need to look elsewhere. But it is a good movie for the whole family to watch. The story line is good... and the cast does a fine job. Recommended. Zeus (voiced by Joey Lawrence) and the Bannister family have moved into a new home just in time for Halloween! When Zeus and George (Gary Valentine of ''The King of Queens'') decide to investigate a creepy neighbor (Lance Henriksen of Aliens), they discover a scary dog (voiced by Mayim Bialik of ''Blossom'' and ''The Big Bang Theory''), a haunted house and form a surprising partnership with a familiar pair of bumbling burglars (Dean Cain and Joey ''Coco'' Diaz). 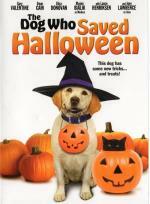 Can Zeus bust some ghosts, find a missing cat and face his biggest fear, all in time to go trick or treating? Elisa Donovan (''Sabrina the Teenage Witch'') and Curtis Armstrong (Revenge of the Nerds) star in this all-new thrills & chills adventure from the creators of The Dog Who Saved Christmas and The Dog Who Saved Christmas Vacation. This one I did find cute and worth the watch... but when it comes to the talking animal movies you are better off watching the buddy movies. I must admit that I liked how this one had a lot of familiar faces in it. The story line while enjoyable enough was highly predictable. I guessed what was going on at the neighbor's house within the first half hour of the film. I would say this one is more suited for the much younger crowd. Christopher Lee wraps on the moldy gauze bandages to become the tormented Kharis, an avenger stalking the hills of Victorian England to track down desecrators of his beloved's Egyptian tomb. This isn't a remake of the original Universal classic, but of the later sequels. This is another take on the story of Kharis and Ananka, compressing elements from Hand, Tomb and Ghost into a single film. In that respect, it's actually better than those three films, because this isn't a story that needs to be spread out over four different films. Equally, Hammer's production values are higher and the use of technicolor creates a wonderful look to the film. Peter Cushing turns in his usual fine performance as the archaeologist, and it is always a treat to watch him. Christopher Lee accomplishes more with the expression in his eyes than many other actors do with their whole bodies. I still wish he had more to work with - a role more like Karloff's in '32 or Vosloo's in the '99 film would be more suited to his talents. This is a typical Hammer film - Victorian setting, foggy British countryside, a rich color palette, a touch of romantic melancholy, and a dash of camp - so if you enjoy Hammer's films, you'll like this one. In one of the most popular horror classics of all time, Boris Karloff reprises his role as he silver screen's most misunderstood monster, who now longs for a mate (Elsa Lanchester). This was a tragic film in so many respects. The horror isn't the monster - the horror is the treatment of the monster. Indeed, it is the way that people treat him that makes him into a monster. When shown kindness, he responds in kind. Shown fear and anger, he equally responds in kind. He is a lonely, persecuted being, judged on his appearance and origin - and that brings about the deaths among the townsfolk. We see that he could have a different life, in his brief friendship with the blind hermit. We see he has the capacity to learn, to care, and to enjoy life. So his decision at the end of the film, that he is better off dead, makes this more tragedy than horror. There was so much that I liked about this film that made the part I disliked so much more pronounced - Una O'Connor's character. That character was so ridiculous, her character overacted and ludicrously hysterical, that she nearly brings the entire tragic atmosphere of the film down. I'd really like to just edit her out of the film, because I enjoyed the rest of it quite a lot. Her aside, this is a classic piece of cinema that everyone should see at some point. 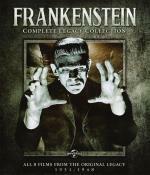 It's a good follow up to Frankenstein, though for me that remains the superior film. 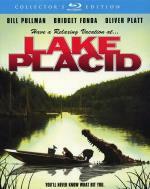 If the hallmark of a good creature film is when you root for the creature, this was a great one. Because I was really rooting for the crocodile to eat people. Especially Bridget Fonda's character. And Oliver Platt's. More Fonda's though, she really got on my nerves. There were scenes that I was like that's supposed to build sympathy for her, so the viewer won't want her to get eaten ... nope, didn't work, still want her to get chomped. My favorite character was the sherriff - him and Betty White were the only ones I really didn't want the croc to eat. Aside from really hating Kelly, and mostly hating Hector, the rest of the film is pretty good. The croc is really well done, and they chose a beautiful location to film at. The script moves briskly, and there are hints to the twist at the end if the viewer really pays attention. Recommended for fans of creature features. This holds up really well on a second viewing. This is such a fun film. Abbott and Costello are my favorite old-time comedy team, and their comedy is still really funny even when you've seen it before. This has a good mix of spooky horror elements and comedy, and the monsters are all treated very well. You've got Bela Lugosi and Lon Chaney Jr. so you can't ask for a better cast (unless they could have gotten Karloff as well). The film works because the horror is treated seriously and doesn't fall into the trap of being too silly or a spoof. 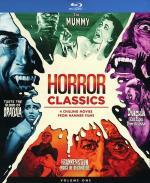 Instead it coems off as an homage to Universal's monsters. Lots of fun, highly recommended. Jonathan and his beautiful sister have moved to a new town in order to start over, leaving a horrible past behind. With the future looking bright, they kick things off with a wild Halloween party on a deserted farm. But there's one guest who wasn't invited and won't let them forget their past. A gruesome pumpkin-headed killer is ready to party—and dying to do some carving. This year, don't answer the door, the trick or treat bags are body bags. This one was recommended to me a while back and when I saw it on sale at Amazon for only $3.99 I couldn't resist checking it out. And it was definitely worth the price paid. I actually enjoyed it quite a bit. Sure a couple of the scenes were a bit over the top for the story. And some of the effects could have been better. But over-all I enjoyed it... glad I added it to my collection. Throughout history, Dracula has filled men's hearts with fear – and the hearts of women with desire. 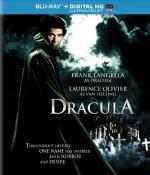 In this stylish production of Bram Stoker's classic tale, Frank Langella gives an electrifying performance as the bloodthirsty Count Dracula in search for his ultimate bride. Meanwhile, the renowned and relentless vampire hunter, Van Helsing (Laurence Olivier), seeks to end the Dark Prince's reign of terror over the citizens of Transylvania. Featuring a mesmerizing cast, fine direction and a superbly atmospheric musical score, Dracula is an unforgettable adaptation of one of the most enduring horror legends of all time. I have been curious about this one for years as I had heard good things about it. While I didn't find it to be a terrible movie... I was expecting more. Mainly I found it to be a little slow for my taste. I did however like the final scene and how they finally defeated Dracula... and then the effects used could have been better. Grated this film is almost 40 years old... but watching it I felt like it was even older effects wise. Worth the time to watch... but don't go in expecting too much. There is definitely better tellings of the story out there. 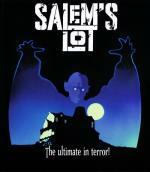 Sinister events bring together a writer (David Soul) fascinated with an old hilltop house; a suave antiques dealer (James Mason) whose expertise goes beyond bric-a-brac; and the dealer's mysterious, pale-skinned "partner" (Reggie Nalder) in "Salem's Lot" — a blood-curdling shocker based on King's novel and directed by Tobe Hooper (Poltergeist). I have loved this one since the first time I saw it back in my teen years. Of course this is an adaptation from the book that Stephen King wrote. Who of course is my favorite horror writer. For a movie that is almost 40 years old... this movie has some decent scares in it. I personally haven't been scared from it since I was a kid... but I do remember it would scare my wife every time we watched it. A couple of my favorite spooky parts in this movie is ..
Needless to say... this is one I would always highly recommend to any horror fan... and an absolute must see for any fan of vampire movies. What's a Yuppie ghost couple (Geena Davis and Alec Baldwin) to do when their quaint New England home is overrun by trendy New Yorkers? Hire a freelance "bio-exorcist" to spook the intruders, of course. As directed by Tim Burton, Michael "Keaton's Beetlejuice is one of the biggest, baddest wolves a ghost movie has ever unleashed, a polter-gas" (The Village Voice). Keaton's work in this and Clean and Sober won him 1988's National Society of Film Critics Best Actor Award. Winona Ryder, Catherine O'Hara, Jeffrey Jones and Sylvia Sidney share starring honors along with wondrous production design, Harry Belafonte soundtrack tunes and Oscar®-winning Best Makeup. I always found this movie to be a lot of fun. Geena Davis was great in the role. And even though I don't normally care for her... I also enjoyed Winona Ryder. This is one that is just plain a fun watch. One that I have seen several times over the years. One I was happy to ugrade to blu-ray... even if they still didn't do much for it when it comes to extras. Believe they just brought over the DVD extras (which wasn't much) and was done with it. Still the film is well worth the time put in to watch it.